"Nathless is a horse I’ve liked right from the start and he’s crying out for a mile... He also showed a bit of natural boot at home early on and I’d like to think he could utilise that turn of foot at the end of a mile." I must admit the Portland was a bit of an afterthought as there wasn't an obvious race for him after winning at Chelmsford, and I'm glad the ground has dried so well, as I didn't expect it to when putting him in. Doncaster is a flat, level track and hasn't been cut up by too much racing on soft ground and Encrypted should love that. He's shown his best form on good, even ground, and I think he's run so well on the all-weather because of the consistency of the surface. I don't see the slight drop from six furlongs being an issue - it's a typical sprint handicap, and the winner is often the horse who gets the gaps at the right time. He couldn't be in better form at home, and while he disappointed at the July Meeting, he's really thrived since then, and was very good last time. He'll obviously need a career best to win such a competitive handicap, but that looks possible given what he's showing at home, so we'll have to keep everything tightly crossed that he gets that luck needed to deliver on the day. Will this be New Orleans' day? He had a long break before running at Thirsk late last month, and we knew he would need that outing, but he traveled quite well and was just getting into it when he got stopped in his run. When a horse needs a race, they can get away with it if everything goes perfectly, and they get a clean run, but if they get their momentum checked and take a breath, that can be game over for them, and that's exactly what happened with New Orleans. His work has been really pleasing since that comeback and he looks tremendous. He's shown he can handle Lingfield and a win is fully overdue with him. For once we've been handed some nice low draws this weekend, and he should get a good run around the inside if he can be cleverly enough away to make the most of his draw. He's definitely got a race in him, and has just been one of those horses who has kept running well in defeat and has frustratingly seen his handicap mark nudged up as a result. Hopefully this will be the day it all comes together. He was gelded and given a break before winning a maiden at Newcastle last time and I thought he needed the run a bit, getting a little tired on the run to the line. I reckon the handicapper has been relatively lenient to him, but we will find out back in handicap company here. He's another who has got the inside draw and that should make life easier for him. Hopefully, he can travel away in the box seat before finishing off, and he showed at Newcastle that he has a decent turn of foot for this grade. He's always promised more at home than he has delivered so far, but he's been growing all the time, and is a very big horse now. I think we might finally have him where we want him, and fingers crossed that proves to be the case. Nathless is a horse I've liked right from the start and he's crying out for a mile, as you'd expect being a son of Nathaniel. He also showed a bit of natural boot at home early on and I'd like to think he could utilise that turn of foot at the end of a mile. He's versatile as far as ground is concerned, has a nice low weight for his nursery debut, and I'm pleasantly surprised that there aren't more runners. He's been pleasing at home, and did a very nice piece of work the other morning in company with Hot Team, who heads to the Curragh on Sunday. I've fond memories of winning this race a few years ago with a horse rated in the 70s called Photography who I got Paddy Mathers to ride as he had such a light weight. He was also 5lb out of the handicap, but got it done on his nursery debut. Like him, Nathless starts out in nurseries with a nice low weight and it's not a very big field, so we're hopeful. He's been gelded since his last run, not because he was a problem at all, but not many future stallions start life rated 76. Whether it will make a difference I don't know, but it's not often they go backward for being gelded, so it makes sense. Ghayadh makes it a hat-trick of handicap runners with the inside stall on the day. He is trying a mile for the first time. He has been cursed by bad luck, really, and never got his preferred quick ground last year after making a winning debut. 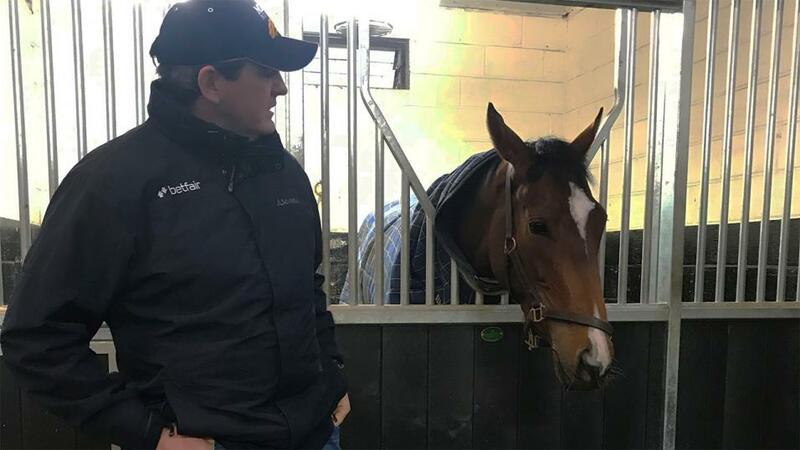 He's looked in his runs over seven furlongs as if he would stay a mile, but it's new territory for him, so it's a big help to be drawn inside as it should ensure that he's not caught wide which would make it a struggle. I'm really positive about his prospects of getting the extra distance, and he's in great nick at home - he's actually a horse with a fair bit of ability, and it's a shame he's only won two races so far.